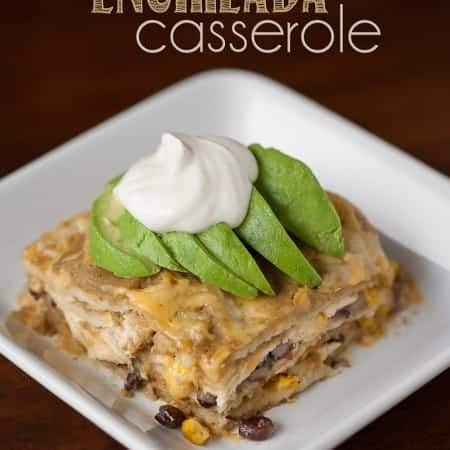 Green Chile Enchilada Casserole is an easy one dish dinner that you can make ahead that the entire family will love. This is one of my most favorite go to one dish casserole meals. Why? Because its easy and it tastes freaking good. Isn’t that what we all want in every meal? I know I do. We had some friends over for dinner and I made a couple of my damn good roasts chickens with one spoon dry rub. We ate until we hurt, but we still ended up with some leftover chicken. This was intentional. I took off all the meat, both white and dark, and save it so I could through it in this casserole the next day. You can just as easily get a rotisserie chicken from the store or cook up some chicken breasts to shred, but remember – the better the chicken, the better it will taste in this casserole. I made my green chile enchilada sauce from scratch. I think it tastes way better than anything that comes from a can, there’s always extra so I smother my breakfast burritos with it, and its way cheaper than store bought sauce. But, I understand, not everyone buys 40 pounds of freshly roasted Hatch green chiles in the month of August and freezes them for future use, so you can definitely just used canned sauce. There are several brands, but if you can find the Hatch brand, I highly recommend it (I’ve seen it at Whole Foods). I also use the roasted corn from Trader Joe’s. See the black on the little piece in my bite photo below? I love using this stuff in my Mexican recipes. Same goes for the Cuban black beans. You can use any old black beans, but why not use some with extra flavor? I also use pre-shredded cheese. I’m a total cheese snob and almost always prefer to shred my own, but allow me to gush over Trader Joe’s one final time. 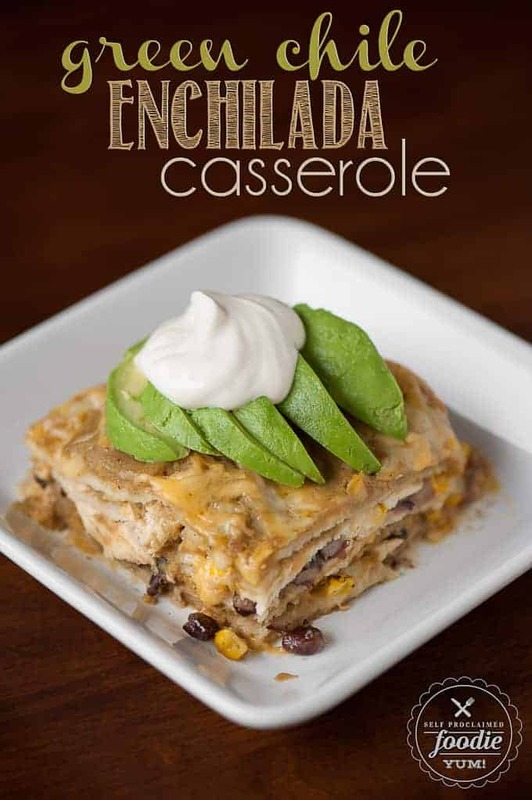 They have this Mexican blend that melts oh so well, and when you’re throwing together a quick on dish casserole dinner, who really wants to shred cheese anyway, right? Pour enough enchilada sauce in a 13x9 inch baking dish to leave a thin layer on the bottom. Use 4 tortillas to cover the bottom of the dish, tearing in half or quarters as needed to not overlap. Spread an even layer of chicken, beans and corn by using half of each ingredient. Take about 1/3 of your cheese and sprinkle over. Cover with about 1/3 of remaining enchilada sauce. Repeat with another 4 tortillas, remaining chicken, beans and corn, and top with half of remaining cheese and enchilada sauce. 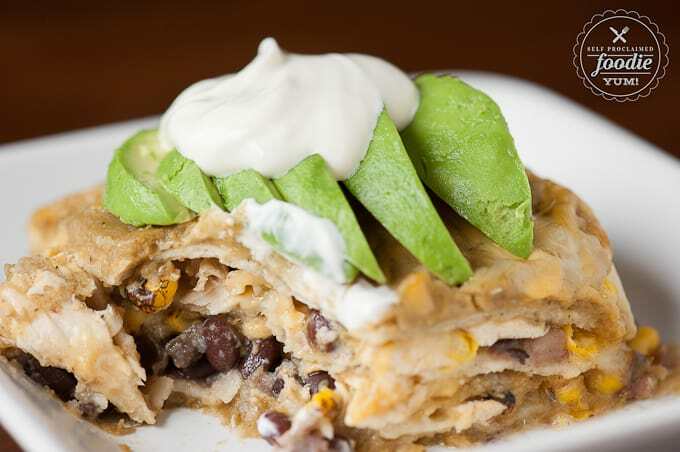 Cover casserole with remaining 4 tortillas, then the remaining enchilada sauce, and cover with remaining shredded cheese. Cover with foil and bake in preheated oven for 30-45 minutes until heated through. Making this delicious looking dish tonight! Thanks for the recipe! As Ben would say, Nummy! Quick and delicious. And I’m sure even better with the homemade sauce.